Dryopteris celsa.J.S. Peterson, hosted by the USDA-NRCS PLANTS Database (Accessed 12/2014). 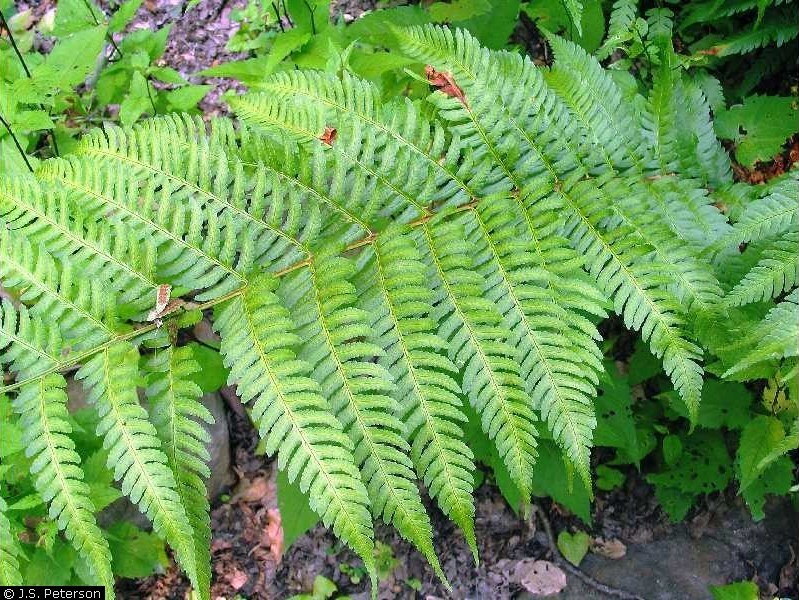 Dryopteris celsa is a fern to 1.2 m tall, from a creeping rhizome. Leaves deciduous, stalk to 50 cm long, scales large, dark center, pale margin, and hair-like pale brown scales; blade 35-60 cm long, 15-30 cm wide, not scaly, egg-shaped to oblong, gradually tapered to tip, base not tapered much, pinnate, leaflets to 18 pairs, pinnately lobed, largest leaflets with 12-15 pairs lobes to 2.5 cm long, margins distantly toothed, basal leaflets narrowed below, lowest segments shorter than those adjacent. 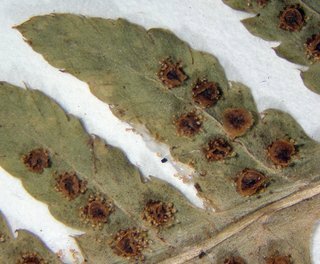 Dryopteris celsa, sporangia,I© George Yatskievych, 2006-2011 (Accessed 4/2018). Spore cases midway between margin and midrib. Frequency in NYC: Rare; NYS S1, E.
Origin: Mostly southern U.S. north to NJ, PA with rare disjunct populations in NYS. Habitat: On rotting logs or rich, moist to wet soil.